SHEFFIELD UNITED - TEAM. 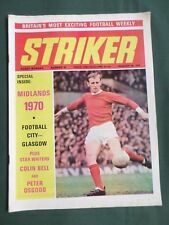 AN ISSUE OF THE UK SOCCER/ FOOTBALL MAGAZINE " STRIKER ". ( NO PAGES MISSING OR CLIP OUTS ). TANNING COLOUR AND FOXING SPOTS ON THE PAPER EDGES - OTHERWISE -VERY GOOD, CLEAN AND COMPLETE, NO WRITING, NO RUST ON THE STAPLES. ABERDEEN F.C - TEAM. 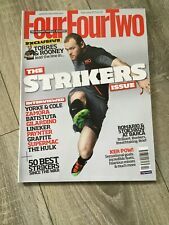 AN ISSUE OF THE UK SOCCER/ FOOTBALL MAGAZINE " STRIKER ". ( NO PAGES MISSING OR CLIP OUTS ). TANNING COLOUR ON THE PAPER EDGES - OTHERWISE -VERY GOOD, CLEAN AND COMPLETE, NO WRITING, NO RUST ON THE STAPLES. 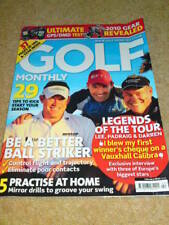 GOLF MONTHLY. BUT IN GOOD CONDITION. GREATEST STRIKERS / JOCK STEIN / DAVE CHARITY. Four Four Two No.29. Excellent Condition. DATED 3 APRIL - 29 MAY 2019. It has been read once. FOOTBALL, DRAMA AND LAUGHS FOR THE PRICE OF A COFFEE. THE LAST WEEKLY COMIC. ISSUE NO. 24 OF. Magazine. 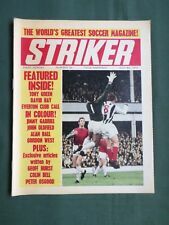 Striker Issue No. 73. Condition is Used. Dispatched with Royal Mail 2nd Class. Magazine. Striker issue No. 71. Condition is Used. Dispatched with Royal Mail 2nd Class Large Letter. Comic. Striker No. 12. In very good condition. Comic. Striker No. 28. March 18-24, 2004. In very good condition. COVER SHOWS BIRMINGHAM PUTTING UP AN 11 MAN WALL. INSIDE FOOTBALL AND STRIKER. NOVEMBER 17th 1973. MARCH 21st 1970. MANY MORE FOOTBALL MAGAZINES FOR SALE. COLOUR CENTRE PAGE SPREAD - PLAYERS MONEY CANNOT BUY. COVER SHOWS QPR WINNING AGAIN. INSIDE FOOTBALL AND STRIKER. JANUARY 19th 1974. COVER SHOWS ACTION FROM LIVERPOOL v EVERTON AND QPR v SHEFFIELD UNITED. INSIDE FOOTBALL AND STRIKER. DECEMBER 15th 1973. COVER SHOWS Q.P.R. v LEICESTER. INSIDE FOOTBALL AND STRIKER. FEBRUARY 9th 1974. INSIDE FOOTBALL AND STRIKER. JANUARY 12th 1974. COVER SHOWS FA CUP ACTION INCLUDING DENIS LAW SCORING FOR MANCHESTER CITY. GOOD CONDITION BUT HAS USUAL CENTRE CREASE. INSIDE FOOTBALL AND STRIKER. MARCH 16th 1974. INTO THE LAST FOUR OF FA CUP. COVER SHOWS ACTION FROM LEEDS v COVENTRY. INSIDE FOOTBALL AND STRIKER. NOVEMBER 24th 1973. INSIDE FOOTBALL AND STRIKER. NOVEMBER 18th 1972. STRIKER MAGAZINE. Very Good Condition.